This guide covers every single issue of Deadpool – both his own series and his many guest appearances. First, I’ll explain how you can have nearly a complete Deadpool collection in the most-efficient fashion and with the fewest books possible in two different formats. Or, chronologically follow Deadpool’s series and appearances issue-by-issue, covering how to collect each one. Marvel releases a line of trade paperbacks under the “Classic” banner that chronologically collect 8-12 issues of a specific title in sequence. 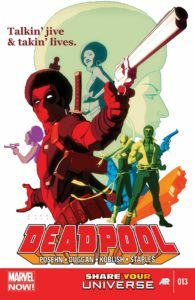 The series usually collects comics from the 70s through the 90s, but with Deadpool, Marvel went a step farther and kept the series running through nearly the present day! This is the easiest way to get your Deadpool bookshelf in order, though there are other ways to collect many of these issues. 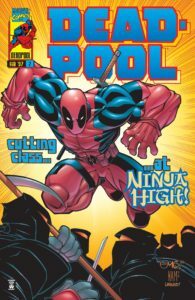 Things get tricky at 2004, as Classic confusingly stops collecting the main Deadpool series and starts to act as a catch-all for his various mini-series and guest appearances. Instead, Deadpool’s main series are collected in “Complete Collection” trade paperback series – which I’ve added in sequence with the Classic collections, below. Classic Vol. 1 – New Mutants #98, Deadpool: The Circle Chase #1-4, Deadpool (1994) #1-4, Deadpool (1997) #1. Classic Vol. 2 – Deadpool (1997) #2-8, -1 ,and Daredevil/Deadpool Annual 1997. Classic Vol. 7 – Deadpool (1997) #46-56 and material from X-Men Unlimited #28. Classic Companion – Collects notable guest appearances through this point – Nomad (1992) #4; Secret Defenders #15-17; Wolverine (1988) #88 & #154-155; X-Force (1991) #47 & 56; Heroes for Hire (1997) #10-11; and material from Avengers (1963) #366; Silver Sable and The Wild Pack #23 & 30; Wolverine Annuals ’95 & ’99; Contest of Champions II #2; Marvel Comics Presents (2007) #10; and Breaking Into Comics the Marvel Way #2. Classic Vol. 9 – Deadpool (1997) #65-69 and Agent X #1-6. The Deadpool Classic series skipped over collecting Deadpool’s next sequential series, 2004’s Cable and Deadpool. It was re-collected into a trio of Ultimate Collections, which was a previous name for Complete Collections. Collects Cable & Deadpool #36-50 and Deadpool / Great Lakes Initiative: Summer Fun Spectacular. 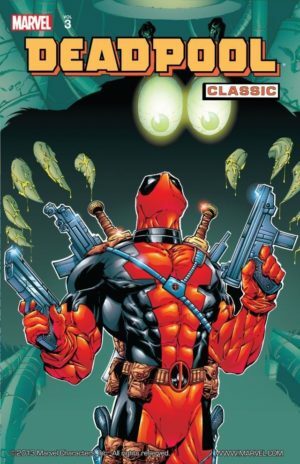 Deadpool Classic also does not collect Deadpool’s next sequential series, 2008’s Deadpool by Daniel Way. It was re-collected into four Complete Collections. 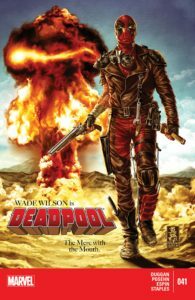 Collects Deadpool (2008) #1-12, plus Thunderbolts #130-131, Wolverine Origins #21-25, and Deadpool Saga (a comic recapping Deadpool’s story, to date). Now we’re back to the Classic series! 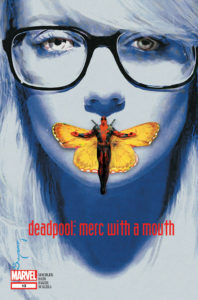 Since the 2004 and 2008 Deadpool books were all collected into easy-to-digest books, the Classic line instead focuses on shorter ongoing series, mini-series, and out-of-continuity Deadpool tales. Thought published later (after Classic #21), the material in this volume begins around this time. It includes Identity Disc #1-5; Ms. Marvel (2006) #40-41; Hulk (2008) #14-17, & 21; Amazing Spider-Man (1999) #611; Doomwar #5-6; Hulked-out Heroes #1-2; material from Shang-Chi: Master Of Kung Fu (2009) #1; X-Force Annual (2009) 1; and World War Hulks 1; and various excerpted pages. Classic Vol. 14: Suicide Kings – Should actually be Classic Volume 11.5. Collects in-continuity mini-series and one-shots. Classic Vol. 15: All the Rest – Collects standalone Deadpool stories from 2008 through 2011. Classic Vol. 17: Headcanon – Collects four alternate reality Deadpool mini-series. Here the main Deadpool series is collected in four Complete Collections while Classic continues to collect around it. This collects skips forward for 20 & 26 because they are Flashback issues. Starting with Classic 18, the series collects material that ran alongside that ongoing. Classic Vol. 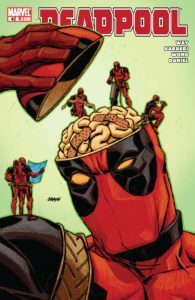 23: Mercs For Money – Contents not yet announced as of this writing, but based on the cover this likely collects Deadpool & The Mercs for Money (2016A) #1-5 and Deadpool & The Mercs for Money (2016B) #1-8. In something out of every bookshelf collector’s wildest dreams, Marvel has methodically collected every single Deadpool appearance into a consistent set of omnibuses that allow you to travel from his 1990 debut nearly through present day without a single gap. Adamantium collections are super-massive coffee-table books – even taller than omnibuses! They include a smattering of all eras of their subject, so are better as a novelty piece or for dabbling fans rather than those collecting entire runs. This one includes New Mutants (1983) #98; Deadpool: The Circle Chase #1-4; Deadpool (1997) #6-8, 44, & 65-69; Daredevil/Deadpool Annual ’97; Black Panther (1998) #23; Cable & Deadpool #20-23; Deadpool (2008) #16-18; Deadpool Kills The Marvel Universe #1-4; Deadpool (2012) #15-19; and Deadpool Secret Comic Variants. If you want the complete Deadpool collection from 1990 to 2015, you’ll be picking up these 12 omnibuses. I have omitted the Deadpool & X-Force Omnibus from this running order because it is not part of having a complete Deadpool bookshelf – his name is included purely for marketing purposes and it duplicates content from these other books. This oversized compendium collects every Joe Kelly Deadpool appearance ever released: Deadpool (1997) #-1, 0, & 1-33; Daredevil/Deadpool Annual ’97; Deadpool/Death Annual ’98, Baby’s First Deadpool Book; Amazing Spider-Man #47 & #611; and material from Deadpool (2008) #900. Collects Cable and Deadpool #1-50 and Deadpool / Great Lakes Initiative: Summer Fun Spectacular. Collects Deadpool (2008) #27-63, 33.1, & 49.1. Previously, the oversize Deadpool (2008) Vol. 11 collected #50-63. Deadpool appears in nearly every issue of this series (he skips #17-18, 19.1, & 30). This tome collects #1-35, including #5.1, 19.1, and material from Wolverine: Road to Hell. Note that this does not collect the three-issue Fear Itself tie-in, which was not written by Remender. Collects all of Cullen Bunn’s Deadpool limited series, most of which are not in standard continuity (though vs. Carnage is): Deadpool Kills The Marvel Universe #1-4, Deadpool Killustrated #1-4, Deadpool Kills Deadpool #1-4, Night of the Living Deadpool #1-4, Deadpool vs. Carnage #1-4. Reprinted in 2016. Collects Deadpool #1-45, Deadpool: Dracula’s Gauntlet, and Death of Wolverine: Deadpool & Captain America #1. This run was also collected in a series of slimmer oversized hardcovers. Collects Deadpool vs. X-Force #1-4, Hawkeye vs. Deadpool #0-4, Art of War #1-4, Return of the Living Deadpool #1-4, Deadpool’s Secret Secret Wars #1-4. Deadpool’s earliest appearances and his first pair of limited series. The first was co-written by Fabian Nicieza and future Uncanny writer/penciler Joe Madureira. X-Men Origins: Deadpool (2010) #1: Originally collected in X-Men Origins (2009) Vol. 2 (hardcover / paperback), and later recollected in Deadpool Classic Vol. 14 (above) and the 2018 X-Men Origins: The Complete Collection. Collects the entire series of period flashback from Deadpool’s Marvel Now series – #26, 20, 13, 7, 250, 34, & 40. Note that these occur at various different points in continuity, are of dubious validity but utter hilarity, and are collected in line with their original run, below. A sequel to his Secret Wars series. A relatively useless collection of first-issues – don’t say you weren’t warned! Collects New Mutants (1983) #98, Deadpool: The Circle Chase #1, Deadpool (1994) #1, Deadpool (1997) #1, Cable & Deadpool #1, Deadpool (2008) #1, Deadpool: Merc With A Mouth #1, Deadpool Team-Up #899, Deadpool Corps #1, Deadpool (2013) #1, Deadpool (2015) #1. X-Force (1991) #2: Collected in Beginnings Omnibus. Also, see X-Force. X-Force (1991) #4-5: May be part of the cameo pages in Beginnings Omnibus. Also, see X-Force. X-Force (1991) #10-11, 14-15, 21-24: Both #11 and 15 are included in Beginnings Omnibus, though other issues may be part of the cameo pages. Also collected in Deadpool & X-Force Omnibus. Also, see X-Force. Collects Deadpool’s first appearance in New Mutants #98, Deadpool: The Circle Chase #1-4, Deadpool (1994) #1-4, and Deadpool (1997) #1. Previously collected as The Circle Chase (ISBN 0785102590). Also collected in Deadpool & X-Force Omnibus. Collects Deadpool’s first appearance in New Mutants #98, Deadpool: The Circle Chase #1-4, Deadpool (1994) #1-4, and Deadpool (1997) #1. Previously collected as Sins of the Past (ISBN 0-7851-0554-9). Also collected in Deadpool & X-Force Omnibus. Silver Sable & The Wild Pack (1992) #23: Collected in both Beginnings Omnibus and Classic Companion. Secret Defenders (1993) #15-17: Collected in both Beginnings Omnibus and Deadpool & The Secret Defenders. Also, see Defenders. 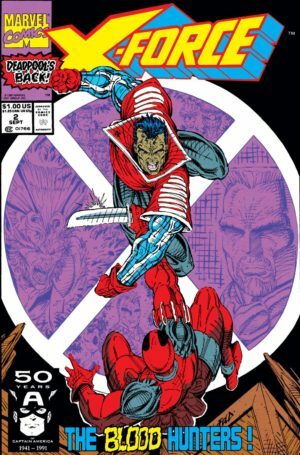 X-Force (1991) #46-47 & 56: Both #47 and 56 collected in both Beginnings Omnibus and Classic Companion, though #46 may be part of the cameo pages in Beginnings. Also, see X-Force. Begins in January 1997, concurrent with Uncanny X-Men #340, X-Men #60, X-Force #62, and Cable #39. Deadpool’s first omnibus! This oversized compendium collects every Joe Kelly Deadpool appearance ever released: Deadpool (1997) #-1, 0, & 1-33; Daredevil/Deadpool Annual ’97; Deadpool/Death Annual ’98, Baby’s First Deadpool Book; Amazing Spider-Man #47 & #611; and material from Deadpool (2008) #900. Collects Deadpool’s first appearance in New Mutants #98, Deadpool: The Circle Chase #1-4, Deadpool (1994) #1-4, and Deadpool (1997) #1. Also collects #-1 and Daredevil/Deadpool Annual 1997, which comes between #7-8. Also includes material from X-Men Unlimited #28 (2nd story), which fits before #46. Also collects Wolverine #162-166. Extremely out of print! It would probably be cheaper to buy individual issues. Also includes Agent X #1-6. Both Deadpool (Agent X) & Cable (Soldier X) were relaunched to fall more in line (and letter X) with the main New X-Men series. Technically, Deadpool only appears as himself in #13-15. Begins in May 2004, just prior to X-Men Reloaded – concurrent with Uncanny X-Men #441 and X-Men #154 (the end of Grant Morrison’s run). House of M intersects the series at issue #17. Cable was the headliner of this series when it debuted in 2004 – again, from the pen of Fabian Nicieza, who writes the entire series (penciled mostly by Patrick Zircher). 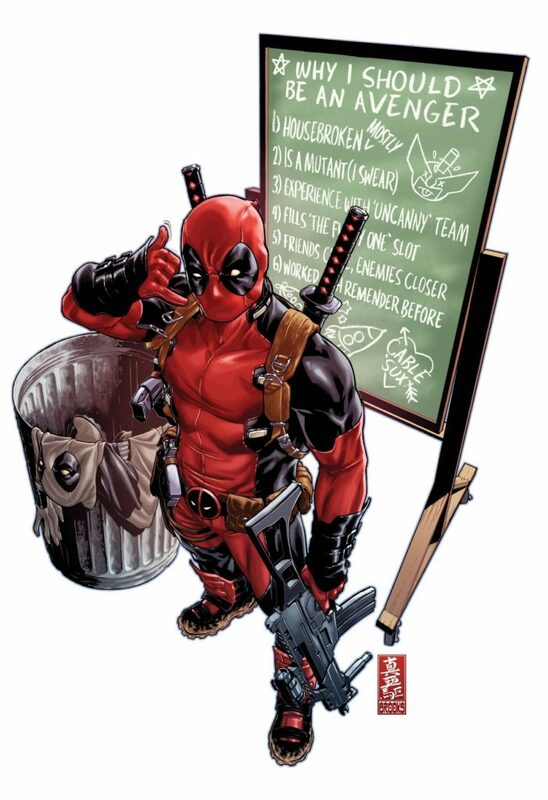 However, in reprints Deadpool is pulling top billing – after almost two decades in the Marvel Universe, he’s one of their hottest (and most humorous) properties. Thanks to that, Marvel collected this entire series into and omnibus and three trade paperback ultimate collection editions. Includes Deadpool / Great Lakes Initiative: Summer Fun Spectacular. Includes Civil War tie-in issues. Also collects Deadpool / Great Lakes Initiative: Summer Fun Spectacular. Begins in October 2008 after the Messiah Complex crossover, and a month behind Uncanny X-Men #500, X-Men Legacy #214, Astonishing X-Men #25, and X-Force (vol. 3) #5. In the Marvel Universe, it begins the midst of Secret Invasion. Deadpool begins this run as only the most nominal of X-characters, but by the end (and his participation in Uncanny X-Force), he has re-established a relationship with some of the team. This run has been condensed into an initial Deluxe Hardcover, as well as a series of ultimate collections, and later in omnibus. Collects Deadpool (2008) #27-63, 33.1, & 49.1. 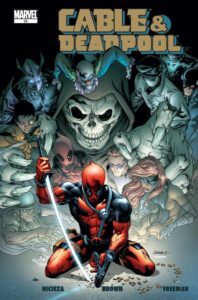 Includes Thunderbolts #130-131 as above, but also a Deadpool-starring arc from Wolverine Origins #21-25 and Deadpool Saga (a comic recapping Deadpool’s story, to date). This is effectively the TPB version of the massive Vol. 11 oversized hardcover. You can also collect it in an original sequents of paperbacks and hardcovers, which also includes two one-shots, an annual, and a mini-series that will not be included in the Complete Collection sequence, above. Deadpool: Game$ Of Death (2009): In Suicide Kings, below. Occurs during or at the end of #7. Also collects Deadpool: Games of Death. Available in oversize hardcover. Collects a crossover with Thunderbolts as of Deadpool Vol. 4 (2008) #8, Thunderbolts (1997) #130, Deadpool Vol. 4 (2008) #9, Thunderbolts (1997) #131. Note that Dark Reign titles did not receive hardcovers. Features Deadpool’s run-in with the San Francisco-based X-Men, as well as a pirate story. Also available in hardcover. Deadpool Team-Up, Vol. 2 (2010) begins here. Issues will be noted as DPTU alongside guest appearances. Collection information is below. Also collects Hit-Monkey #1. Also available in hardcover. Deadpool & Cable #26 (2011) was released here, but occurs after Cable & Deadpool #50, above. Collected in All in the Family, below. Uncanny X-Force (2010) begins here. It will be noted alongside guest appearances as UXF. Deadpool appears in nearly every issue of this series. See X-Force for collection information. Collects the two oversized anthology issues; they do not fit here in chronology. All of the following Deadpool appearances occur between #36-37, so from a trade-reading order perspective you should read them all prior to Volume 8. Collects a crossover with Amazing Spider-Man Annual #38 and Incredible Hulks Annual #1. No TPB released. A split volume with the similarly violent and comedic Fear Itself: Fearsome Foursome. Available in hardcover. Also collects Fear Itself: The Deep #1-4, an entertaining prelude to The Defenders staring Namor, Loa, and Dr. Strange. Available in hardcover. After #49 & 49.1: Battle Scars (2012) #3-4, Wolverine Vol. 4 (2010) #16, X-Men Vol. 3 (2010) #25-27, UXF #10-18, Uncanny X-Force (2010) #19-23 simultaneous to Wolverine & X-Men (2011) #4. This run was initially released in oversize hardcover. That hardcover never saw a companion release of a TPB. Instead, Marvel is releasing the same run as a “Complete Collection.” However, unless the solicited contents change, this will effectively serve as the TPB of Vol. 11. Begins after Deadpool (2008) #18 with issue #899 and counts backwards. For reading order, see above in Deadpool (2008). Also includes Marvel Spotlight: Deadpool. Available in hardcover. Also collects Wolverine/Deadpool: The Decoy. Available in hardcover. 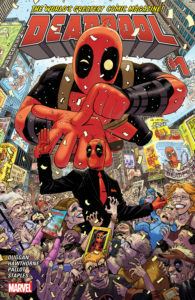 A relaunched Deadpool ongoing series penned by comedians Brian Posehn and Gerry Duggan, with primary artist Tony Moore. This maintains (or even increases) the madcap gag-a-minute pace of the prior run, though Posehn and Duggan are much funnier than their predecessor. Collects the digital series that leads directly into the next volume. Also collects Death Of Wolverine: Deadpool & Captain America #1. Collects the entire series of period flashback issues from this run – #26, 20, 13, 7, 250, 34, & 40. Note that all of these are collected in line with their original runs, below. Thunderbolts (2013) starts here.It will be noted alongside guest appearances as TB. Deadpool appears in nearly every issue of this series. See Thunderbolts for collection information. #20-25: Vol. 4: Deadpool vs S.H.I.E.L.D. This series does fit into chronology here, directly before Axis. 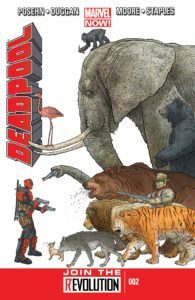 Also in Deadpool Minibus 2 Oversize Hardcover, Classic Vol. 18: Deadpool vs. Marvel, and Deadpool By Posehn & Duggan: The Complete Collection Vol. 3. Axis: See Marvel Universe Events. This is a rare Marvel Universe Event where Deadpool is a featured supporting character. Secret Wars: See Marvel Universe Events. Deadpool does not appear in the main Secret War series; only in his tie-ins. Deadpool is everywhere in All-New, All-Different Marvel! 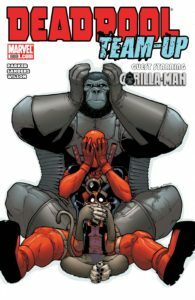 Not only does he return to his own series as the leader of a team of Deadpool’s for hire, but he joins the cast of Uncanny Avengers, splits a team-up book with Spider-Man, and leads his team in their own title – plus, Marvel launches Gwenpool, a mash-up of Deadpool and Spider-Gwen!. That’s a lot of your favorite Merc with a Mouth! Contains only the A-story of 21. Also collects the story assembled from secret comic variants of Deadpool #1-21. Collects the Deadpool 2099 stories which are also included in his regular World’s Greatest volumes. In this period, Deadpool stars in Avengers (2015) #0 (Uncanny Avengers story) and Uncanny Avengers (2015B) #1-10. See Uncanny Avengers. Deadpool #30 is an 80-page giant issue. This also collects the comic composed of variant covers from secret comic variants of Deadpool #1-21. Another Bunn mini-series, though this is in continuity! This is the confirmed issue range, despite some solicits saying otherwise. A sort of an epilogue to both the Joe Kelly and Robbie Thompson portions of this series, bringing together their themes. Other Deadpool series and limited series…. Does not fit here in continuity – it is a sequel to his Secret Wars series. Deadpool’s first original graphic novel, penned by none other than Rob Liefeld! I am not certain of its placement. Collects You Are Deadpool (2018) #1-5, an choose-your-own-adventure style Deadpool gaming experience in the form of a comic. I’m not certain if this must fit before or after #300. Writer Skottie Young takes over the Deadpool franchise from Gerry Duggan after his five-year run. 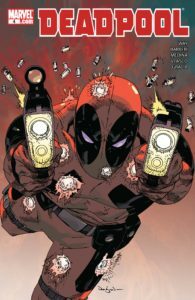 Collects Deadpool: Assassin (2018) #1-5 by Cullen Bunn, a series that helps to link from the end of Despicable Deadpool to this new series. A Marvel Digital Original for Comixology. Collects Black Panther vs. Deadpool (2018) #1-5. Deadpool has a brief confrontation with The Avengers (including Panther) early in his series, which might suggest this comes later. 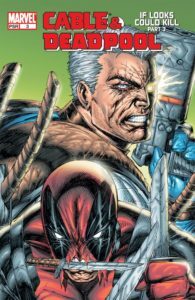 Cable and Deadpool Annual 1: Pending solicitation. One of several standalone annuals out in 2018. A harder-edged, continuity-free set of Deadpool adventures. Collected entirely in a single Oversized Hardcover, along with X-Mas Special (ISBN 0785157077). Also includes X-Mas Special. Available in hardcover. Also available in hardcover. Included in Deadpool Classic, Vol. 17: Headcanon. One-sh0t. Occurs between Deadpool Corps #3-4. Collected in Women of Marvel. Collects all of Cullen Bunn’s Deadpool limited series, most of which are not in standard continuity: Deadpool Kills The Marvel Universe #1-4, Deadpool Killustrated #1-4, Deadpool Kills Deadpool #1-4, Night of the Living Deadpool #1-4, Deadpool vs. Carnage #1-4. Reprinted in 2016. In the same continuity as Deadpool Kills the Marvel Universe. In the same continuity as Deadpool Kills the Marvel Universe. Included in Deadpool Classic, Vol. 17: Headcanon. Included in Deadpool Classic, Vol. 17: Headcanon. Check Amazon for Marvel’s newest Deadpool titles. do you guys have a shorter version off him ” deadpool” ? Sorry, Gabriel – I’m not entirely sure what you’re asking. A shorter version of this guide, shorter Deadpool stories, or something else? Thank you for this amazing guide. I think I own everything on there, and maybe more? Were does the “Secret Avengers (2014)” by Ales Kot fit in with the above and out of the 3 paperback volumes available how many issues does he feature in? I wish to collect all the Omnibus’s however I’m concerned that some content may not be present in them, is it possible to do the Omnibus reading order with any Trade Paperbacks included in order to have everything? This includes stuff like alternate Deadpools such as Dogpool, Lady Deadpool,, Deadpool 2099 etc. Deadpool kills deadpool is actually set in continuity tho it hops all over the multiverse and includes the deadpool corps! it ultimately is Deadpool (earth 616) vs Deadpool (earth 12101) also known as Dreadpool. and also these guides are awesome. If I collect EVERY paperback classic/collection, what would be missing from the collection? 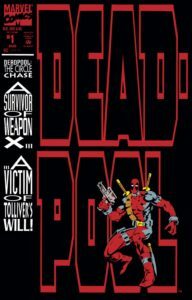 The Deadpool Classic line effectively skips the series that got Ultimate/Complete Collections – namely, Way and Duggan. They don’t catch EVERY side-series to those, but you’d be pretty darn close.